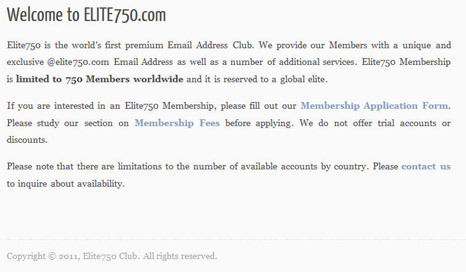 There's so many free email service on the internet such as gmail, yahoo mail, hotmail and many more of them but now there's a premium email address club which is called as Elite 750. To register your name @Elite750.com Email address you have to pay membership fees $ 7.500 and a monthly fees of $750!! and this email address club is limited to 750 Member worldwide. Their features and the membership fees has made them as the World's most exclusive E-mail services. This Elite750 Email club was a special email service for Rich people. by paying the membership fees of $7,500 and a monthly fees of $750. So what's the features of the Elite750 Email? all of your emails will be printed and filed by Elite750 team. You can also send all letters to be archived safely through their 24 Hours Service, Beside those features there will be more exclusive features for @elite750 .com email address. visit their website at elite750.com/services to know further about their exclusive email services. This email services from Elite750 might be perfect for those who need a recognition as a Rich people. How about you? Will you register for @elite750.com email address?? Great idea, but this price is so high.